St. Andrew’s Admission 2020 will start in the month of February 2020. 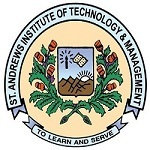 St. Andrew’s Institute of Technology and Management is a private institute located in Gurgaon, India. The Institution offers admission in various UG programmes in the Engineering & Technology and Management fields. Candidates get admission in B.Tech (various specializations), BBA, BCA, etc. courses. For admission into various programmes candidates will get admission based on 12th level scores or JEE Main Scores (For engineering seats). Candidates must read this complete article to know various details about St. Andrew’s Admission 2020 including application form, eligibility and much more. B.Tech (Civil Engineering, Computer Science Engineering, Electronics & Telecommunication Engineering, Electrical Engineering, Mechanical Engineering), BCA, BBA. Candidates can fill their St. Andrew’s 2020 Application Form through both online and offline mode. Candidates will be able to fill their application form from the last week of January 2020. Candidates must fill all the details correctly in the application form and submit before the last date of submission. The application forms can also be obtained from the campus. Candidates have to upload the scanned photograph of the 10th and 12th class mark sheets during application process. After completion of application process, candidates must take printout of the application form and send one copy of application form with student copy to the institute. The application fee for all courses is Rs. 250. Mode of Payment: Candidates can pay the application fees in online or offline modes. Candidates can pay online application fees via debit card, credit card or net banking. For offline mode, application fees can be paid through the demand draft (DD) in favor of ‘St. Andrews Institute of Technology and Management’. Qualification: Candidates must have passed 10th and 12th level from any recognized board. Marks: Candidates must have secured minimum of 45% marks aggregate in the qualifying exam. Qualification: Candidates must have passed 10th & 12th level from any recognized board. Marks: Candidates must secure minimum of 45% aggregate in PCM and Biology and Computer subjects. Reservation of Seats: 50% seats will be provided to the candidates based on the JEE Mains score. 25% seats will be given to the candidates based on 10+2 level scores. Admission into St. Institute of Technology and Management will be provided to the candidates in various programmes. Candidates will get admission on the basis of online counselling organized on campus. Selection will be done based on 12th level percentage or JEE Main score. Students are required to submit the application form first for getting shortlisted. The authority will select candidates and inform through call or mail regarding the counselling process. Students have to reach the counseling venue on time with the necessary documents for final selection. The university will publish the St. Andrew’s 2020 Merit List after the application process will complete. The merit list will be published in online mode. Candidates will be invited through mail or call for the counselling. Only the shortlisted candidates in the merit list will be able to attend the counselling round. The university will prepare separate merit list for each course. It will be prepared based on 12th level scores or JEE Main scores. Students will be invited for the counselling as per the rank obtained by them in the merit list. St. Andrew’s 2020 Counselling will start after the publication of merit list. Counselling will be held in online mode. During the counselling session, the document verification and seat allotment of the candidates will be done. Students whose percentage will lie within the cut off marks will be selected and offered letter of admission and scholarship. To confirm seat, students have to pay certain amount of fee by online mode. Admission into Engineering & Technology and management programmes will be provided on the basis of score obtained in 12th level and JEE Main entrance test. Students have to apply first by online mode after which authority will shortlist candidates for counselling session. Only the shortlisted students will be informed for counselling through mail or call. Students will be told about the counselling dates and time. For counselling, students have to reach the counselling venue 15 minutes before the allotted timing. Final admission will be provided to the students based on scores of 12th / JEE Main, eligibility clauses and other factors. If you have any other query regarding St. Andrew’s Admission 2020, you can ask us by leaving your comment below.